Back in September 2014 the MCW Review featured an article by a Primary School Teacher and her colleagues sharing their experiences of working life. It describes how some had chosen to go part-time just so that they didn‟t have to work weekends which is what the result of full-time teaching actually meant in practice. The demands of work time and balancing family life meant exhausted teachers. Now, 4 years later newspaper headlines point to the fact that there is an “out flux” of teachers lining up to leave (Guardian Education, 10th April 2018). This June edition mirrors the same phenomena, albeit highlighting how the demands of the workplace are affecting the health of workers. Various political parties have supported quotas being introduced into public services and contracted-out services; companies have set up exacting timescales of service provision, delivery and response times which have met with general popular approval. As a result, expectations have risen within the general population. However, these populist measures when introduced failed to acknowledge that whilst we are customers, travellers, students, patients, we are also the workers who have to provide and maintain this same level of immediate service demand. Individuals can allocate themselves or be allocated into particular compartments where they become at odds with each other and themselves particularly when, simultaneously, funding and resources are cut for a variety of reasons. Unsustainable and unworkable are words repeated as article after article in various newspapers refer to the widespread recognition of work-related stress. Long hours; not in control of how the job or role is carried out; no input into how the job could be improved; working towards goals and quotas that are more quantifiable than qualitative; all contribute to the stress factors being identified in too many places of work. The MCW welcomed Otto Meier and Toni Santamaria in preparation for the European Seminar taking place in Birmingham during October 2018. 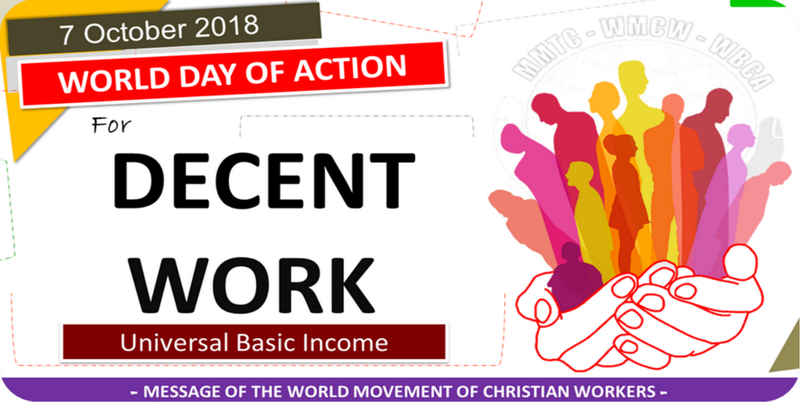 With the theme Digital Work, anytime, anywhere and its impact on workers and their families the experiences in this edition, although not specifically about digitalisation, are more than likely to be replicated and will inevitably beg the question how we can protect the rights of all workers. The MCW does not receive funding from any source other than its members and supporters. The membership fee is a minimum of £12 per person annually. New Issue of MCW Review: "Solidarity: We are in this together"
Each editorial of our previous 2017 MCW Reviews illustrated a component of the Review of Life Method; See (February) and Judge (May). Reflecting on the lived experiences and realities of ourselves and others in the light of Gospel values may only become meaningful if it becomes a provocation to take positive action towards change. Taking action can be a frightening prospect and a real challenge. However, it is important to put „taking action‟ into a context. Whilst doing nothing is not an option, we all have limits as to what is possible, of what we can do and what we can be involved in. Our actions can be small or they may involve more complicated steps. Sometimes the process of simply raising our own awareness and then sharing it with others is quite a telling act in itself. What do we want to see changed? What can we do? How can we involve others in our actions are all questions arising at this stage of the Review of Life. What is crucial however is that you are not alone and that the aims and objectives are achievable. Having others sharing your aims along with a unity of purpose creates a solidarity of action and the continuing belief in the need for change; the need to be part of making that change. 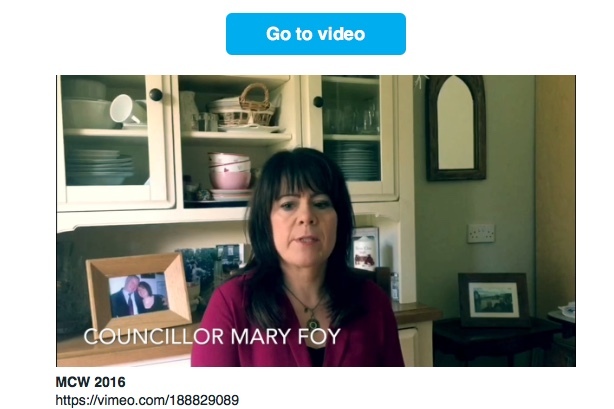 Being one person trying to raise the awareness of someone else is no less of a challenge or important than a group supporting someone taking action in the community or a workplace, or a member who has taken on a role as an MP, Local Councillor or Trade Union Rep. All are seeking to rise to the demand of being part of making change. 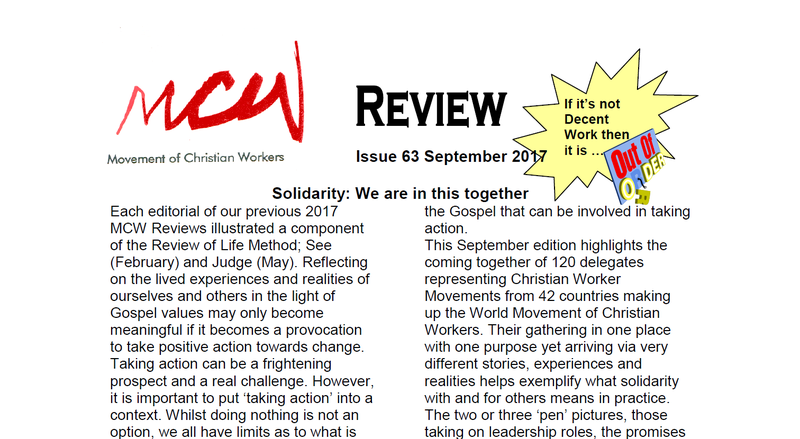 This particular MCW Review highlights a much larger gathering which epitomises the resolve, tenacity and commitment to the Gospel that can be involved in taking action. World Day for Decent Work 7 October 2016 "Ending Corporate Greed"
Experience of young graduate woman In my first week I worked 53 hours. Most shifts lasted 14 hours. Shifts can end anywhere between 12:30 a.m. and 2:00 a.m.
14 hours standing up and walking around with no food. Starting at 11:00 a.m. did mean you got something, maybe cheese on toast. They were trying to be good by giving food but really if you work a 12+ hour shift you don’t really need your food in the first hour. Not all restaurant/bars are like this although some are. I’ve left this place now.